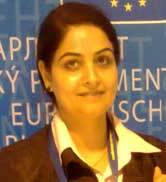 Jammu, July 23: Dr. Meenakshi Kilam Director, Centre for Quality Assurance and Strategic Planning and Colleges Development Council, University of Jammu attended the European Union Visitors Fellowship Programme in Brussels , Belgium. The European Union Visitors Programme enables leaders from non-member countries to visit the Institutions of the European Union, as guests of the European Parliament and the European Commission. The purpose of the programme was to visit and interact with organizations and people working on conflict management and promotion of peace in conflict areas and also to visit Universities, higher educational institutions and non-profit organizations and institutions to explore avenues of cooperation in quality assurance and promotion of mobility for students and academic and administrative staff in higher educational institutions. During her stay at Brussels, Dr. Meenakshi Kilam held series of meetings in Directorate General for External relations of the European Commission, Directorate General for Education and Culture in the European Commission, General Secretariat of the Council of the European Union and also met Honorary Secretary General of Transeuropean Policy Studies Association. She held meetings with Members of the European parliament and House of Representatives from various political Groups and independent Policy advisors with interest on Kashmir, India, Education and Culture. Apart from EU, she also interacted with Member Parliaments and Civil Servants from Belgian Government including Mr. Tony KEULEERS, Secretary General for Higher Education at the Belgian Ministry of Education. Among the Higher Education Institutions, she also held meetings with Mr Peter van der HIJDEN, Head of Sector for Higher Education Policy Unit for Higher education; "Erasmus Munda" in the Directorate-General for Education and Culture of the European Commission. She also had meetings in Vrij Universitat Brussel (VUB – Brussels Free University) with Mr Anthony ANTOINE, Director of the Institute for European Studies of the and Dr Paul LIM, Deputy Director and Senior Academic Adviser at the European Institute for Asian Studies (EIAS). Dr. Meenakshi Kilam discussed the improvement in the prevailing situation in Jammu and Kashmir and stressed upon need for path breaking initiatives for involving civil society for larger cooperation between the European Union and the J&K. On behalf of University of Jammu, she extended invitation to the various Educational and Administrative heads of Europe Union for closer ties. It is pertinent to mention here that Dr. Meenakshi Kilam has also attended an "International Visitors Leadership Programme" of US State Department for the State of Jammu and Kashmir on ‘Educational Leadership in 2006.